For thousands of years, in many different cultures and in many diverse forms, the labyrinth's enigmatic shape has reappeared to tantalize archeologists and historians. What were these magical mazes used for, and why? What meaning could they hold for us today? 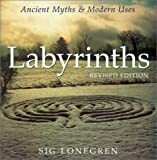 Through myths, stories, and symbolism we enter the labyrinth's sacred space, and into its very heart where we can reach and understand its mysteries: how it enhances awareness and forces us to become attuned to the convoluted path in order to reach our goal. As we work our way through its various forms, from ancient Greece to Native America, through its legends, links with dream imagery, role in women's history, energies and planetary connections, we are given practical projects for personal growth. Draw your own labyrinths, use them as problem-solving tools, and even build real ones on a lawn or inside with a string and masking tape.